Probably one of the scariest scenes in cinema is that shower scene in Psycho, the 1960 horror/thriller film directed by Alfred Hitchcock. You know, the one when Norman Bates attacks that poor girl in the shower. Check out the grim echoes in shower of terror: foamy the squirrel. 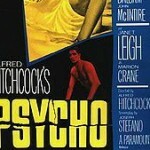 Anthony Perkins does an amazing job as the psycho killer. He plays it cool … in a totally torqued-out way and makes that Norman Bates all too human. Humans can be the most frightening and frightful creatures! 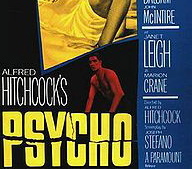 And poor Marion Crane (Janet Leigh). She certainly gets hers for stealing that $40,000 from her employer. So you see the film is very moralistic in a way. So no stealing because Norman Bates is waiting.